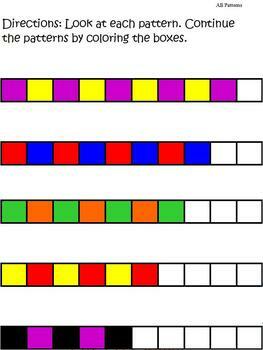 This is a colorful 7-page packet for teaching AB patterns. It can be used in life skills classes, self-contained special education classes, or for students in an inclusive setting that require an alternate assignment. This packet can also be used for also be used for elementary students in the general education setting. I have used this in my self-contained class of moderate disabilities for students in grades 6-8 working on about a first grade level. 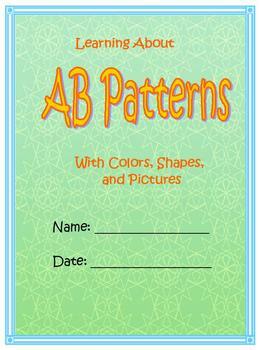 This packet explains what AB patterns are, and then has 5 pages of activities copying and continuing patterns. Some pictures are from Boardmaker, others are clip art. 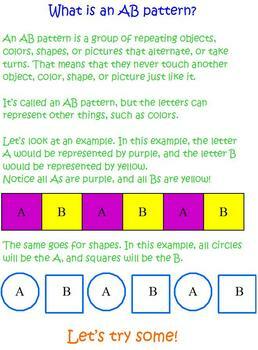 Page 2: Explains what an AB pattern is in simple terms with two examples. Page 3: Students copy the pattern they see by coloring boxes to recreate the pattern. There are three of these. Page 4: Simlar to page 3, but students color boxes to continue, not just copy, the patterns. Page 5: Cut and paste activity with Boardmaker animal symbols. Students must cut and paste the correct animal to complete the AB pattern. Page 6: Which picture comes next? Circle the correct picture to complete the AB pattern. Page 7: Students are to draw the shape that comes next in the AB pattern. Boardmaker pictures are used to simplify the definitions for students with special needs, especially those with autism. 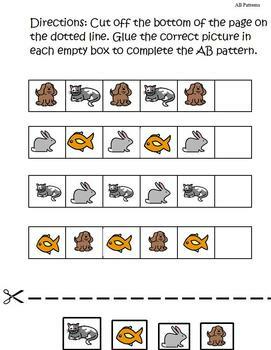 1.A.2.b: Given a repeating pattern using symbols, shapes, designs, and/or pictures with 2, 3, and/or 4 objects in the core, student will continue the pattern.